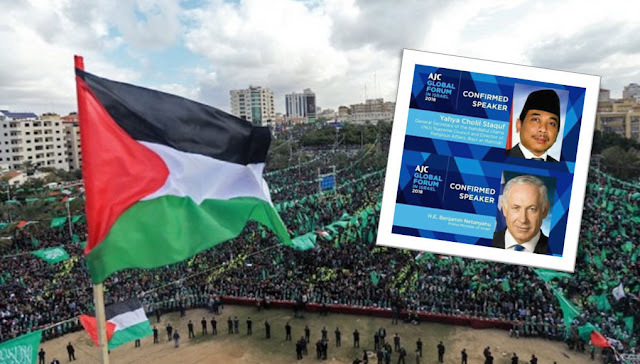 Islamedia - Situs resmi Harokah al Muqowamah al Islamiyah (HAMAS) atau Gerakan Perlawanan Islam hamas.ps mengeluarkan rilis kecaman atas kunjungan tokoh NU Yahya Staquf ke Israel untuk menjadi pembicara dalam American Jewish Committee (AJC) Global Forum di Yerusalem, Israel, pada hari ahad(10/6/2018). تلقت حركة المقاومة الإسلامية "حماس" كما كل الشعب الفلسطيني باستهجان شديد الأخبار التي تتحدث عن زيارة العالم الإسلامي يحيى خليل ثقوف من أندونيسيا للكيان الصهيوني، رغم عدم وجود علاقات رسمية بين أندونيسيا والكيان، واعتراض الكثيرين في أندونيسيا وخاصة العلماء على هذه الزيارة، وإننا إذ نقدر لأندونيسيا أكبر الدول الإسلامية وشعبها وعلمائها ومواقفها التاريخية الداعمة لحقوق شعبنا ونضالاته من أجل الحرية والاستقلال، فإننا نعرب عن استنكارنا وإدانتنا لهذا العمل المشين لما سيشكله من إهانة ليس لشعبنا فقط وتضحياته، بل وللشعب الأندونيسي وتاريخه الطويل في دعم القضية الفلسطينية. كمّا أن هذه الزيارة تمثل دعما كبيرا لهذا العدو الفاشي وشرعيته، وتعطيه الغطاء لارتكاب المزيد من الجرائم بحق شعبنا ومقدساته، وتفتح الباب واسعاً لكل من يرغب في التطبيع مع الاحتلال. The Islamic Resistance Movement Hamas, along with the Palestinian people, received with severe censure the news that Islamic scholar Yahya Khalil Thaqouf is visiting the Zionist Entity despite the lack of official relations between Indonesia and the Zionist Entity and the Indonesian people's complete opposition to this visit. As we appreciate Indonesia's historic stances in support of the Palestinian people's rights and their struggle for freedom and independence, we express our condemnation to this disgraceful act, which is not only an insult to the Palestinian people and their sacrifices but for the Indonesian people and their long history in supporting the Palestinian cause.